Omsk State Medical University is one of the oldest universities of Siberia; it was founded in 1920 as the Medical Division of Siberian Institute of Veterinary Medicine and Zoology which enrolled 186 students. In 1921, West Siberian State Medical Institute was created, its first rector was N.K. Ivanov-Emin. In 1924, it was renamed as Omsk State Medical Institute. In autumn 1931, the Maternity and Child Protection Faculty was established which later was reorganized into the Pediatric Faculty. The Sanitary and Hygienic Faculty was founded in 1938 (now it is the Preventive Medicine Faculty). In 1957, there was the admission for the Dentistry Faculty. The fifth faculty established was the Faculty of Pharmacy which started to enroll students in 2002. In 1994, the Institute was granted with the status of State Medical Academy. 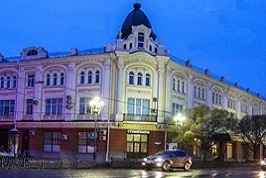 On the 5th of December 2011, Omsk Medical College was affiliated with Omsk State Medical Academy. In 2015, the Academy was assigned with the status of University. Today the University is one of largest medical universities in Siberian Region and Russia as a whole. The University’s educational activity is confirmed by Quality Management System Certificate of Conformity to requirements of GOST R ISO 9001-2008 (ISO 9001:2008). According to results of official and independent expertise, OSMU is constantly ranked among 100 best universities of Russia. As a result of many years' activity the University has trained more than 35 thousand doctors. Its graduates work in all regions of the country, as well as in CIS and non-CIS countries. The indisputable achievement of OSMU is its number of employer-sponsored students which is 45.4 % of the total number of state-funded students. Today the contracts on training of doctors are concluded with administrations and public health authorities of Omsk, Kurgan, Tomsk, Novosibirsk Regions, Khanty-Mansiysk Autonomous Okrug, Krasnoyarsk Krai, Altai Krai and other Regions. Every year more than 8.5 thousand doctors graduate from the University. The University consists of Academic Affairs Department, Pre-University Training and Career Center, five Faculties, four College’s Departments, Center for Professional Advancement and Retraining of Specialists, Financial-Economic Department, Central Research Laboratory, Center for International Affairs and Information Technology, Department of Clinical Care and Practical Training, Maintenance Department and autonomous business units: Center for Laboratory Diagnostics, a clinic, Publishing and Printing Center. The training of specialists is conducted in the following fields of study: “General Medicine”, “Pediatrics”, “Preventive Medicine”, “Dentistry”, “Pharmacy”, as well as in all programmes of pre-university and postgraduate education. The College’s training is conducted in the field of “General Medicine”, “Nursing”, “Laboratory Diagnostics” and “Pharmacy”. The educational process is conducted at 67 departments, where 122 professors and doctors of sciences, 343 PhD holders work. Among the lecturers there are five Honored Scientists of the Russian Federation; three Honorary Figures of Russian Higher Education; 13 Honored Doctors of the Russian Federation, one Honored Health Care Worker of the Russian Federation, 37 Excellent Workers of Public Health of the Russian Federation. More than 180 employees were awarded Diplomas of the President of the Russian Federation, Government of the Russian Federation, Ministry of Public Health and Social Development of the Russian Federation, and Government of Omsk Region. Classes are given in six of their own buildings. In addition, to organize the educational process, the University uses 33 clinics of the leading medical institutions of the Сity and the Region, which are equipped with modern diagnostic and therapeutic facilities. The educational process is constantly modernized on the basis of modern information technologies. The University has a rich library, numbering about 600,000 printed titles, as well as an electronic reading hall with access to Internet resources. Since 2002, the library is a member of ARLICON (Association of Regional Library and Information Consortium), which allows using the resources of the country's remote libraries, and since 2005, it has joined the "Russian Medicine" project under the leadership of the CRML (Central Research Medical Library), in which the medical libraries of Moscow, Perm, Kazan, Vladikavkaz, and others participate. All the literature is lended out through an electronic system. - improvement of drug assistance to the population of Siberian Region. Young employees of OSMU are permanent participants of the U.M.N.I.K. contest. It is pleasant to note that five young OSMU scientists won this contest in the nominations "Medicine of the Future" and "Biotechnologies" in May 2012. The Center for International Affairs and Information Technology of OSMU was established in 2001. The birth of the Center was due to the won grant from the Russian Foundation for Fundamental Research. The toolkit of the network programme was created for these funds - the shell of the telemedicine system, its hardware and software structure, the fiber-optic line was installed, and connection to the national educational network was made. OSMU got access to the Internet. The local network was created, uniting 35 computers of the University and located near the Omsk Specialized Trauma and Orthopedic Hospital. To develop information technologies there were 1.5 million rubles spent. OSMU had new opportunities to organize the educational process online and to conduct scientific research, which made OSMU a pioneer and leader of the Region in a new promising direction - telemedicine. The website, created in OSMU, took the eighth place in Russia and the first one among medical universities behind the Urals in design and traffic in 2001. In 2002, the University obtained a federal license for the provision of services to the united information network of computer communication. The Regional departmental programme for the computerization of treatment and preventive institutions was designed for the period until 2010. There was an opportunity to provide additional educational programmes online through remote access system. The Center consisted of two Departments – Information Technology and International Affairs. It was supervised by the administrative group including a Vice-Rector and Heads of Departments. V.A. Akulinin, MD, PhD, was the Vice-Rector of the Center for International Affairs and Information Technology. The Department was headed by Professor V.K. Kosenok, MD, PhD. The Department carried out the initiation and coordination of international cooperation projects, contacts with international organizations and universities, passports and visas control, student professional exchange within the International Federation of Medical Students' Associations. The first head of the Department was Professor V.L. Stasenko, MD, PhD. The Department defined the directions of work in the field of information technologies, created and supported the Academy's website http://omsk-osma.ru/en, organized and conducted e-learning, took part in creation and was a part of the Regional telemedicine system in Omsk Region. N.B. Vdolazsky headed the Department after the resignation of V.L. Stasenko and remained the Head of the Department until 2014. 2002. Collaboration with Strasbourg began thanks to the initiative of Gilbert Massard, a world-renowned thoracic surgeon, Professor of the Faculty of Medicine at the University of Strasbourg, who has been an Honorary Professor at OSMU for many years. Everything started with the joint activities of Professors V.K. Kosenok and G. Massard, then projects and fruitful cooperation appeared. With the active participation of French and Russian Professors Gilbert Massard and V.K. Kosenok, the first bilateral Cooperation Agreement was signed in 2003 between OSMU and the Faculty of Medicine at Louis Pasteur University of Strasbourg for a period of five years, which was twice extended in 2007 and 2013 and is valid until now. Due to friendship, a successful partnership of Omsk and Strasbourg scientists in the field of Respiratory Surgery has grown. Thanks to the desire of the French colleagues to expand their presence in Russia, and on the part of Omsk people - to introduce European medical developments into everyday medical practice in our clinics, Omsk Medical University became one of the parties of the large-scale TEMPUS JEP-26029 - 2005 project "Modernization of Training Courses for Oncology Service in Omsk Region". The international consortium was established to implement the project programme. On the Russian part, it included Omsk State Medical University, Clinical Oncology Dispensary of Omsk and Omsk Region and the Ministry of Public Health of Omsk Region. The Altai Division of N.N. Blokhin Russian Cancer Research Center is a consultant partner in the field of introducing innovative technologies to academic and practical activities. The partners of Europe are the Faculty of Medicine at the University of Strasbourg and the University of Luxembourg. One of the strategic directions of the development of the higher medical education, defined by the logic of the Bologna process, is the stimulation of academic mobility, the introduction of a credit system and a quality management system with the prospect of international accreditation. Therefore, the first two years of work on the project were characterized by high mobility. In general, during the project, fifty-five trips from the Russian Federation to Strasbourg and Luxembourg and forty-four trips of staff from European participant universities to Omsk have been made. A number of coordination meetings of the project participants took place in Russia and France. The French colleagues got acquainted with the practice of training of doctors for Oncology Service in Omsk Region, delivered lectures on the burning issues of modern Oncology, and conducted a number of surgeon’s show cases using innovative techniques. The main result of the project was the creation of steering documents and training packages that meet international standards for oncologists who are studying at the Oncology Department of OSMU in the framework of postgraduate education. The work was carried out in the main areas of medical assistance types and terminated by the publication of training aids that were reviewed internally and externally and were recommended to use in medical and pharmaceutical universities of the country as training aids for higher medical education. The availability of the latest knowledge in the field of Oncology was the fundamental moment and the most important academic goal of international cooperation. In addition, due to close interaction with practical Public Health, the dissemination and rational use of the received information among the target audience was ensured. Within the framework of the current Agreement, the cooperation between the Oncology Department of OSMU and the Thoracic Surgery Department of the University of Strasbourg continues, research and application conferences, round tables, master classes are held. In April 2008, the bilateral Agreement between OSMU and Francophone Virtual Medical University (France) was signed, within the framework of which the agreement on transferring access to the mirror server of training programmes for all available medical professions for OSMU students and employees was reached. 2009 - the Agreement was signed with the University of Luxembourg. The Agreement provides for the development of joint scientific research in Psychology, Physiology and Psychological Rehabilitation of oncology patients. According to the Agreement, young scientists and professors of Omsk State Medical University will have the opportunity to conduct research on animal models and collect the necessary material in addition to their clinical research in laboratories. The contract is extended and valid until 2019. One of the significant events of 2009 was funding for implementation of the TEMPUS–IV project, which aim was to create the life-long training system for lecturers of medical universities. The project’s participants were the University of Strasbourg (France), University of Luxembourg, Ruhr-University Bochum (Germany), University of Rome Tor Vergata (Italy), Francophone Virtual Medical University (France), Ministry of Public Health of the Russian Federation, Sechenov Moscow State Medical University, Omsk State Medical University, Northern State Medical University, Irkutsk State Medical Academy of Postgraduate Education, Vladivostok State Medical University, Volgograd State Medical University. The tasks of the project were: development of qualification requirements for lecturers of medical universities; modernization of training programmes for lecturers of medical universities; improvement of certification mechanisms of pedagogical staff and implementation of modern tools to control the quality of medical education, as well as the creation of an interactive portal "Medical Education". During the project’s implementation period, there were several coordination councils, seminars, master classes and working meetings. During the project, 12 analytical materials and teaching aids were published with the stamp of the Educational and Methodological Association for Medical and Pharmaceutical Education of Russian Universities. It was not easy to organize joint and coordinated work of all universities. For employees of the OSMU International Affairs Department, coordinating the work of the project, it was a very difficult and dynamic period. The work was non-stop without days off. International student academic mobility has been in effect in OSMU since 1997, when the University became a full member of IFMSA (International Federation of Medical Students' Associations), where Russia is represented by the National Union of Medical Students. Maxim Mokin, a student of OSMU, became a pioneer in the field of student international cooperation. In 2007, the National Union of Medical Students joined the International Association of Dental Students (IADS), which allowed Russian dental students, including students of Dentistry Faculty of OSMU, to take part in international exchanges. Since 2007, active work has begun with the programmes of the German Academic Exchange Service (DAAD), which is already a rather difficult task, as, firstly, there are few scholarships for participation in such programmes for medical students (much less than for students of linguistic or technical specialties). Secondly, as a rule, medical universities in the European part of Russia have priorities. OSMU for the first time won the scholarship of the German Academic Exchange Service (DAAD) for a study tour to Germany of a group consisting of 14 OSMU students (from the second to the fifth year) for 2 weeks, which was held from the 27th of January to the 7th of February. The programme of stay in Germany was extremely rich and included visits to higher educational institutions and major leading clinics: the Charité Clinic, Emergency Hospital and Clinic for Oncohematology in Berlin; Clinic of the Faculty of Medicine at the Friedrich Schiller University, Jena, and the Clinic of the Faculty of Medicine at the Dresden Technical University. And in April 2013, the second application successfully passed the competitive selection with subsequent financing and from the 14th to the 26th of July 2013, 15 students of OSMU got acquainted with university clinics in Bonn, Dusseldorf and Bochum. In August 2014, for the first time students of the General Medicine Faculty of OSMU were trained at the ​​Academy of Foreign Languages (Malta, Nice). On the 1st of April 2014 OSMU International Affairs Department was reorganized. The management of international affairs in OSMU was headed by Svetlana A. Pisklakova, Head of International Affairs Department. During 2014-2015, new contracts in the field of Public Health, academic, scientific and cultural cooperation between OSMU and Karaganda State Medical University, Medical University of Astana, Kazakh-Russian Medical University, Almaty, Kazakh National Medical University named after Asfendiyarov, Almaty, the Republic of Kazakhstan and the Kyrgyz Russian Slavic University named after B.N. Yeltsin, the Republic of Kyrgyzstan were signed. In July 2015, OSMU joined the Russian-Chinese Association of Medical Universities, whose main task is to organize international cooperation in the field of training, research and medical activities. It has already become a tradition for three years of 2014-2016 to host two leading European linguists in the autumn: Sabina ERHART, Professor of the University of Luxembourg, and Alan Davis, a lecturer at the Foreign Languages ​​Center of Ruhr University of Bochum, Germany. Sabina ERHART annually prepares series of lectures for OSMU students on the interaction of languages ​​in the European area, the importance of cross-cultural professional communication for medical specialists, emphasizing the idea of ​​continuity and connection between languages ​​and cultures, as well as methodological seminars for lecturers of Foreign Languages ​​Department of OSMU and linguists of Omsk Universities. And Alan Davis, specializing in professional medical English, conducts an intensive course for OSMU students. The beginning of 2017 was marked by a new cooperation agreement between OSMU and Riga Medical University named after Paul Stradyn, as well as a new area of cooperation with the University of Luxembourg in the study of Parkinson's disease (Department of Neurology for Advanced Professional Training, headed by Prof. A.S. Rozhdestvensky, and the Luxembourg Centre for Systems Biomedicine, headed by Prof. Rudy Balling). From the 16th to 28th of February 2015, twelve students of the Faculty of Medicine at the Ruhr University in Bochum (Germany) attended a series of classes on Pediatric Gynecology and Andrology based in Public Health institutions of Omsk. For the first time Omsk hosted an event of such magnitude; students from Germany came to study in Russia. For both parties it was the first experience of such cooperation. During the year, project coordinators Andreas BURGER, Ruhr University of Bochum, Germany, RUB and Svetlana Pisklakova, Head of International Affairs Department, discussed the upcoming event, agreed on the dates, training programmes, requirements for students and school instructors. Training of German students was conducted in English. For this purpose, all lectures, practical classes, training cases, situational tasks were translated into English. The training programme was designed in such a way as to give students as much knowledge as possible in a short time. Lectures familiar to Omsk students were adapted for the perception of foreign students. At the same time, all material was formed taking into account Russian, American and European techniques. Among the lecturers of the OSMU Winter Medical School are professors Vitaly Okhlopkov, Andrey Pisklakov, Sergey Barinov, associate professors Inna Shamina, Irina Medyannikova and Natalia Pavlenko, the chief pediatric gynecologist in Omsk. Twenty-four OSMU students took an active part in the work of the School. Problem-oriented learning: how it works and what you need to know to be a tutor. Development of clinical tasks and training materials for problem-oriented learning. Ways to mark the oral response. More than 20 lecturers of the departments and employees of the OSMU Academic Affairs Department were trained at the seminar. The Second International Winter School 2016 "Reproductive Health of Adolescents" was traditionally held in February, the interest in which was also huge, and the participants expressed their warmest thanks for the high level of organization and relevance of the chosen subject, for the high professionalism of our lecturers, for the clinical cases and unique operations presented in an interesting way. The Third International Winter School 2018 "Reproductive Health of Adolescents" took place in February as it became a tradition. The opening ceremony was held on January 29. Students from eight countries participated in the School. Due to this fact, the School has aquired a truly international dimension. During two weeks students studied under the best pediatric gynecologists and andrologists of Omsk, attended lectures and master classes, assisted in an operating room. The organizers of the School offered a rich cultural programme to the participants, so this School will be long remembered. Since September 2014, the Course of Linguistics and Cross-Cultural Professional Communication has begun. The aim of the Course is to ensure the continuity of language training in a medical university to integrate Russian medical specialists into the European and world information and educational space. Medical English for academic purposes (participation in an international scientific conference). Cooperation with foreign partners continues to gather its pace. There are still many plans and ideas to be pursued. Non-resident students studying at the University live in dormitories. The University has 6 dormitories. This life allows all students to bring their talents to light. Its cameo theatre Agar and dance ensemble Inspiration are quite famous. There are a lot of sports clubs for those who like doing sports. The University has its own sports and recreation facilities in the suburban recreation area. The most important achievement is the victory in the open public competition The Healthy Lifestyle University, held under the auspices of the InterRegional Public Organization Council of Rectors of Medical and Pharmaceutical Universities in Russia with the support of the United Russia political party, the Ministry of Public Health and Social Development of the Russian Federation and the Ministry of Education and Science of the Russian Federation in 2012 and 2015. Here are some links that might be interesting to you. You can find more information about Omsk, places to visit, local news, etc. both in English and Russian.